Based in Brisbane, this team provided project management services to national clients and were experts in their field. They wanted to educate the market on the services that they offered and use it as a platform to reach out, connect and engage. LinkedIn was the ideal platform for this business to position itself as authorities within their field. 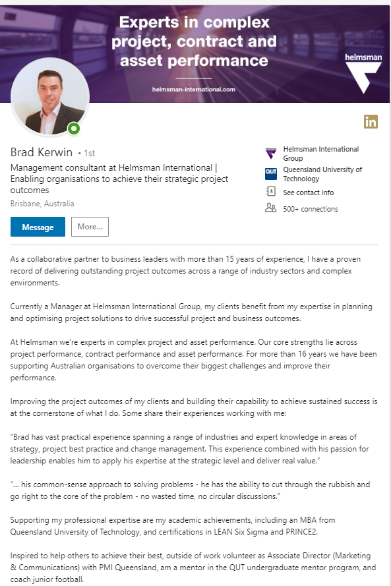 Inconsistencies in how key individuals were presented on LinkedIn and misalignment with the overarching marketing strategy. Positioning that didn’t reflect the individual expertise and company offerings. Limited social proof and demonstration of expertise and knowledge. Develop consistent profiles for key team members to be consistent with the overarching strategy. Create a targeted strategy to position the team’s authority and expertise. Engage in a training and development program to increase team member capability. We transformed key team member profiles to be uniformed and consistent with their marketing strategy. Created a targeted strategy to position their expertise in the corporate marketing that included visual elements. Once established, key team members were trained in using LinkedIn to increase their capability.